Difference between revisions of "Blast processing"
The net result means the process is generally impractical for standard Mega Drive games outside of static screens, but becomes a more attractive prospect when a [[Sega Mega-CD]] is introduced. The Mega-CD, with its own 68000 processor, has been shown to be able to assist the Mega Drive in running games in this new graphics mode. Blast processing was a marketing term coined by Sega of America to promote the Sega Mega Drive (Sega Genesis in that region) video game console over its nearest rival, the Super Nintendo Entertainment System (SNES), in North America. "What makes the Genesis the superior machine?" It has "blast processing". 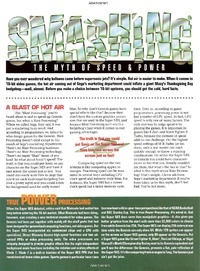 While the Mega Drive was indeed capable of faster processing performance than the SNES, particularly due to its Yamaha YM7101 VDP graphics processor's faster DMA unit (see Sega Mega Drive/Hardware comparison (Super NES) and Sega Mega Drive/Technical specifications for more technical details), the term "blast processing" itself was vague and unclear, due to a lack of technical explanation from Sega. The term is thus open to interpretation, and has been interpreted in different ways, as a reference to either the Mega Drive's faster performance, its higher CPU clock rate, its faster DMA unit, a specific DMA color trick, or just a marketing term. While the term would be used several times across Sega's marketing output, "blast processing" is usually remembered in North America for appearing in a 30-second commercial by Sega's choice of marketing agency, Goodby Silverstein & Partners. A Genesis (linked up to a TV) is strapped to a high-speed drag racer, while a Super NES is strapped to an old van. A drag race occurs, with the Genesis speeding off, displaying footage from Sonic the Hedgehog 2, Ecco the Dolphin and Streets of Rage 2. The Super NES, however, stutters while Super Mario Kart plays. Inevtiably the Genesis "wins". The advert wasn't designed to cause people to think about what was being said, just that Sega and the Genesis were "better" than Nintendo and the Super NES. These sorts of "attack ads" were commonplace in the US at the time - other countries with stricter advertising regulations would not be able to air it, not least because it is a difficult to prove the truthfulness of what was being said. The term was not officially used outside of North America, likely for this reason. In addition to provoking hardware comparisons, the advert also has a subtle dig at Super Mario Kart - Nintendo's flagship racing game which relies on the Super NES' hardware graphics mode, "Mode 7", as well as a built-in DSP-1 enhancement chip, a math co-processor that further improved the system's Mode 7 capabilities. Mode 7 allows the Super NES to scale and rotate background planes - something only achievable on the Mega Drive through software. It was not thought at the time that a game like Mario Kart could run on the Mega Drive with the same performance profile, yet Sega of America (perhaps ambitiously) chose to portray it as the "slower" game. "Blast processing" became a fixture of Sega's advertising campaigns throughout the 1992 holiday season and into 1993. The following year the Welcome to the Next Level campaign became the face of Sega of America's advertising, and the term was never used again. “ Sadly I have to take responsibility for that ghastly phrase. Marty Franz [Sega technical director] discovered that you could do this nifty trick with the display system by hooking the scan line interrupt and firing off a DMA at just the right time. The result was that you could effectively jam data onto the graphics chip while the scan line was being drawn – which meant you could drive the DAC's with 8 bits per pixel. Assuming you could get the timing just right you could draw 256 color static images. There were all kinds of subtleties to the timing and the trick didn't work reliably on all iterations of the hardware but you could do it and it was cool as heck. So during the runup to the western launch of Sega-CD the PR guys interviewed me about what made the platform interesting from a technical standpoint and somewhere in there I mentioned the fact that you could just "blast data into the DAC's" Well they loved the word 'blast' and the next thing I knew Blast Processing was born. Oy. As it transpires, "blast processing" was a graphical trick discovered by Marty Franz, taking advantage of a trick in the Yamaha YM7101 VDP graphics processor's DMA unit. On a Mega Drive, it is possible to change the colour palette during the H-blank interval by "DMA-ing" information into CRAM, however doing so has the (usually) unwanted side effect of creating CRAM dots - rogue pixels which would corrupt the image if the trick was used too often. Despite this, mid-frame colour palette changes were not unusual on the Mega Drive - Sonic the Hedgehog uses this trick whenever it needs to display water in Labyrinth Zone, and masks the CRAM dots by drawing a flickering water surface sprite roughly where the palette changeover occurs. However, if the programmer knew when these CRAM Dots were likely to appear, a screen could be drawn just by rapidly changing the palette (i.e. the whole image would be drawn with the CRAM dots glitch). Initially it was thought that this technique could be used to generate 256-colour images, however the likes of Traveller's Tales' Jon Burton, who had also discovered the trick, managed to bump up the number to 512, simulating as many as 4096 by rapidly changing between two frames. The downside to this technique is that it relies on perfect timing across the Mega Drive hardware, or the lines drawn would appear out of phase, and thus the image would be distorted. This, and the fact the technique was never well documented to begin with, meant that no commercial games made use of this so-called "blast processing" technique. It would not be until many years later when a perfectly synced blast processing technique would be achieved, but at the expense of fully utilising the Mega Drive's 68000 processor in order to display an image. The process also produces "chunky" pixels, meaning that while 512 colour images are technically possible, they do not make use of the full 320x224 screen resolution. The net result means the process is generally impractical for standard Mega Drive games outside of static screens, but becomes a more attractive prospect when a Sega Mega-CD is introduced. The Mega-CD, with its own 68000 processor, has been shown to be able to assist the Mega Drive in running games in this new graphics mode. The technique of drawing an image by through using DMA was not understood by Sega of America's marketing department (or indeed by many developers, as again, it was never seen in commercial games). Instead, the words "blast" and "processing" were picked up and ran with, with the media and general public tasked with filling in the blanks. For many years, it was assumed that the term was referring to the Mega Drive's CPU, the 68000, having a higher clock rate than the Ricoh 5A22 S-CPU found in the Super NES. At a time when technical details were hard to come by, it was widely assumed that bigger numbers were better, without taking into account what the two integrated circuits were actually doing with each clock cycle. Blast processing was also used in conjunction with Sonic the Hedgehog 2 advertising, to suggest that it made Sonic "faster than ever". In this case, Sonic 2 is a faster game because the ground speed cap was removed (leading to a situation in Chemical Plant Zone where Sonic appears to out-run the camera). This was entirely the decision of the programming team behind the game, rather than a hardware trick. It claimed that the Genesis did not have any hardware or technology that gave a "Blast" boost. This is an incredibly vague statement to make, given that all part of the Mega Drive work in tandem to produce video games. It does, however, suggest that Nintendo were about as unaware of what blast processing really meant as everyone else at the time. It claimed that the SNES was just as fast as the Genesis. To support this claim, it noted that, while the Super Nintendo's Ricoh 5A22 S-CPU has a slower clock rate, it has faster memory transfer per cycle, claiming that this gives it faster data transfer speed. However, the Mega Drive's 68000 CPU has a wider 16-bit external data bus, twice as wide as the S-CPU's 8-bit external data bus, which means the 68000 transfers 16-bit data per cycle, whereas the S-CPU transfers 8-bit data per cycle, giving the 68000 a faster data transfer speed. 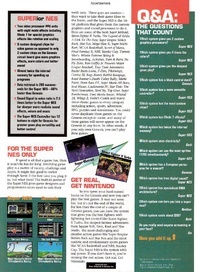 It claimed the SNES's larger RAM gives it superiority in terms of speeding-up programs. However, RAM speed is largely determined by bandwidth. The Genesis has faster RAM bandwidth, making it faster for program access. Furthermore, it can read program data from the ROM cartridge at a higher speed than the SNES. It claimed that the SNES is capable of scaling Sonic. However, Mode 7 only scales backgrounds, not sprites. The SNES usually required enhancement chips such as the SuperFX to achieve true sprite-scaling. It suggested that the Genesis is not capable of scaling or rotation. This is true from a hardware perspective, but can be (and was) achieved through software programming. The Mega-CD also adds support for scaling and rotation. It suggested that only the SNES has specialised DMA hardware capable of high-speed DMA. However, the Genesis has a DMA unit with faster DMA transfer speeds than the SNES. Its statement that the SNES has a higher sprite display limit is true, but misleading, as it can only reach its display limit when using small sprites. The Genesis displays more sprite tiles and has a higher sprite fillrate, which allows the Genesis to display a higher number of large sprites, as well as a greater variety of sprites. Its claim that the SNES produces sharper sound than the Genesis is not true, as the Mega Drive's Yamaha YM2612 sound chip produces a higher 53 kHz output than the Super Nintendo's Sony chip which produces a 32 kHz output. It appears to be supporting the claim by referring to Gaussian filtering reducing noise, but this limits the frequency range, resulting in a more muffled sound on the SNES and sharper audio clarity on the Genesis. Its implication that only the SNES has true digital sound is not true, as the Mega Drive's YM2612 chip is also capable of true digital sound. It can play PCM samples at up to 8-bit 32 kHz, slightly below the Super Nintendo's 16-bit 32 kHz limit. The Genesis can also stream PCM audio from the ROM cartridge at a comparable bitrate while using less of its bandwidth (due to the Genesis having greater bandwidth). "Blast processing" was a term used only briefly by Sega in one region of the world, but it has since become synonymous with the Mega Drive console. In the years after the system was discontinued (and indeed when Sega left the video game console market entirely), "blast processing" has made its name in popular culture, appearing in Sega-related merchandise and even some video games (such as Sonic Mania). While a deliberately vague term misunderstood by most consumers, it achieved Sega's goal of generating recognition for their video game console, while simultaneously causing people to challege the credentials of its rival, the Super NES. In more recent years, there have been websites and programmers that have interpreted "blast processing" as a reference to the Yamaha YM7101 VDP graphics processor's faster DMA unit. Homebrew programmers in recent years have used the DMA unit to demonstrate various graphical and audio capabilities that were previously not thought possible on the Mega Drive (or the SNES). Some thus view its DMA unit as a "blast processor".